Bike Safe Portland accident reports are here! Hey folks! 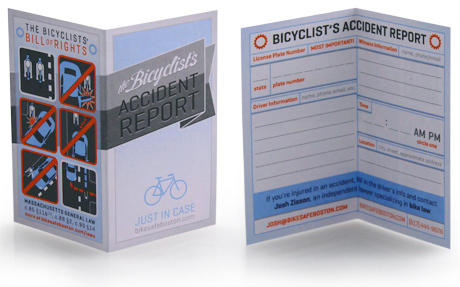 We’ve partnered with Josh Zisson from Bike Safe Boston to bring you the Oregon version of the innovative bicycle accident report cards that he’s created to fill the need that many of us have for a clear documentation procedure in case of an accident while riding your bicycle. We’re excited about the empowering aspect of these, since many people who have replaced their car with a bicycle no longer have an insurance company’s instructions for what to do when you get into a fender bender. But even if you drive a car occasionally, you most likely are not carrying your car insurance packet with you, and in the confusion of the moment it can be difficult to remember what details are important to make note of. This is especially pertinent to a situation where the other party doesn’t stick around to find out how things ended up! See our Bike Safe Portland page for the most recently updated list of shops to visit! Additionally, if you are a business owner or know of a place that ought to have a stack of these available to customers, get in touch with us at thesprocketpodcast@gmail.com and we will do our best to get you connected and supplied.